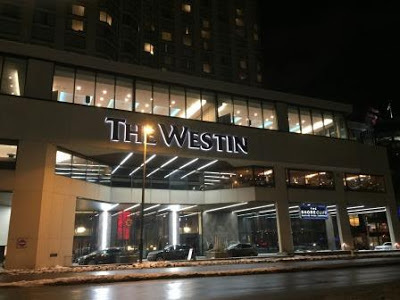 While we were in Ottawa, Teena and I stayed at the Westin Ottawa which is close to the Byward market. The view from our room was excellent as we overlooked the Parliament Buildings, the Chateau Laurier Hotel and the Rideau Canal. The canal when frozen, such as now, becomes the world's largest skating rink. Robes are supplied, which I wore to the salt water pool and hot tub. There also is a nice sized workout room and a spa also in the hotel. I would definitely stay here again.